Your loved ones will be unable to resist these tasty fritters. P.S. They're even more delicious served hot! Bring the milk and water to the boil with a piece of lemon rind, then add the sugar and rice, stir thoroughly and continue cooking for about 15 minutes. Take off the heat and leave to cool. When the rice is cold, heat the oil in a deep saucepan. Score the vanilla pod along its length and use a small knife to remove the seeds from the inside. Add the vanilla to the rice with the pine-nuts and sultanas. Taste the mixture and add a little more sugar if it seems to lack flavour. Add the flour and the egg and stir thoroughly to create a uniform mixture. 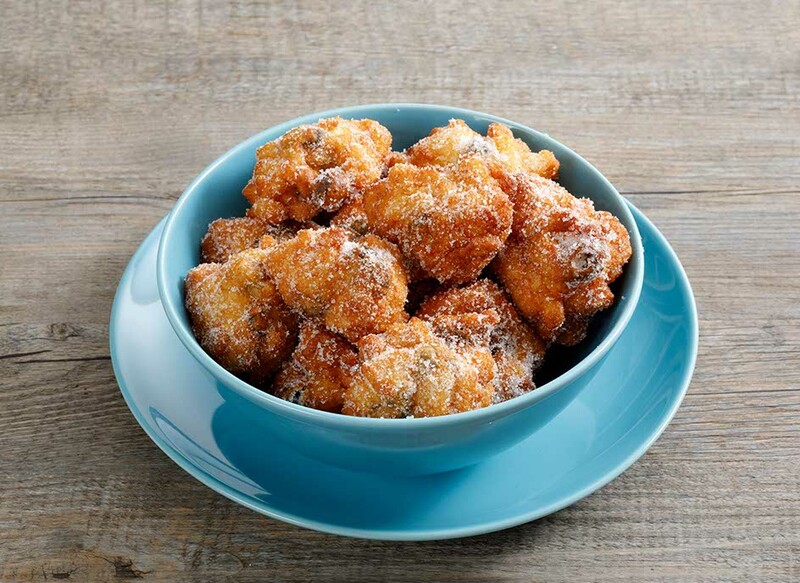 Drop spoonfuls of the mixture into the hot oil and fry on both sides until the fritters are golden brown. Dry thoroughly on kitchen roll, dip in the rest of the granulated sugar and serve hot.